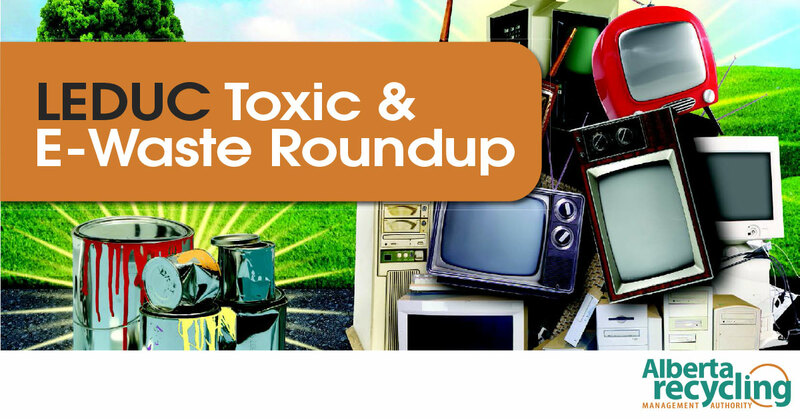 Leduc’s Toxic & E-Waste Roundup to be held Saturday, Oct. 13 from 8 a.m. to 5 p.m. at the temporary location of the Eco Station (6108 46 St). The Roundup offers residents and business owners from the City of Leduc and Leduc County an opportunity to dispose of small loads of a variety of items in an environmentally responsible way. Examples of household toxic waste include paint, aerosol cans, solvents, abrasive cleaners, insecticides, bleach, carpet cleaner, glue, hair colouring, nail polish, wax and weed killer. Examples of electronic waste, or e-waste, include computers, computer cables, computer mice, keyboards, CD players, digital cameras, electronic games, iPods, radios, phones, printers and TVs. Those attending the roundup can enter their names for a grand prize draw of an Apple iPad mini. Attednees can also enjoy coffee and a doughnut compliments of Leduc’s Tim Hortons. Residents and business owners are reminded that the Eco Station accepts household toxic waste, e-waste, recyclable materials and organic materials at no charge all year around. The facility also accepts one bag of household waste for free. The fee for additional bags is $2 per bag. Last year the Leduc’s Eco Station saw over 27,500 visits, resulting in the diversion of over 60 tonnes of e-waste and nearly 100,000 litres of household hazardous waste. For more information on toxic and e-waste materials and for Eco Station hours, check out Leduc.ca, call the Eco-smart Hotline at 780-980-7107 or e-mail ecosmart@leduc.ca.